Tonight we had that steak that I dread to grill (or even look at), because I bought it off this guy in a meat truck. Seemed like a good idea (and price) at the time, but this steak is just not all that prime. We're in a recession. 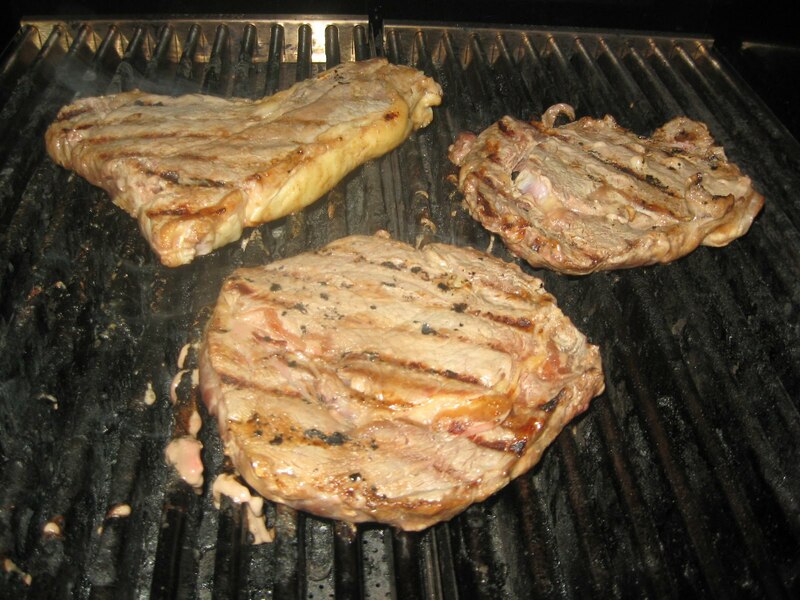 I've always hated to waste food, but I do hate to spend time on the grill and have poor results. So, that steak has been going begging as we say in the South. 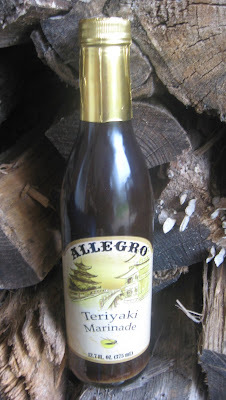 My college son gave me a gift certificate to a gourmet food store in Chapel Hill, and I bought Allegro Hot & Spicy marinade and fell in love with it. The company noticed that, and they sent me some samples of other products in their line as I really can't find them here. You can visit Allegro and find out where to buy near your home, and you can also buy these products online - thankfully. I had to give it some thought, but I decided that the Allegro Teriyaki Marinade would be a good pick. I was thinking to grill these thin steaks and serve them on sandwich buns. I didn't want anything too overpowering with the steaks cut too thin (in my estimation). Really, I was not wanting bologna. The steaks went in the marinade about 45 minutes before I was ready to grill. They were thawed prior, and the extra time gave them a chance to get up closer to room temperature which works better on a grill (prevents sticking and makes for more even grilling). It also lets the flavors meld. I watched these steaks close, because they were thin (and one was thicker - a T bone maybe?) plus it was cold outside. Brrr. I used the Char Broil Urban grill, because it is super easy, and the heat retention is super. With the lower quality steak, I wanted a pretty solid medium (to slightly on the done side of that). If you press the steak with the tongs, and it feels kind of like the skin between your thumb and forefinger, then that's about right there. Some people will tell you to go toward rare and cut on the grain with lower grade steak. That works, but the guys here will not eat steak that is bleeding. That is just not on the table. I had been reading up on Allegro after I found that I so loved the Hot & Spicy they make, and they started out making marinades that would make lower priced cuts more tender and taste better. I felt better right then. I knew these were, for sure, not top quality cuts. But, who can afford the best stuff all the time now? I hoped the Allegro would fix them up and take them beyond . . . well yuck. I was shivering cold but thought I had nailed my Allegro steaks. 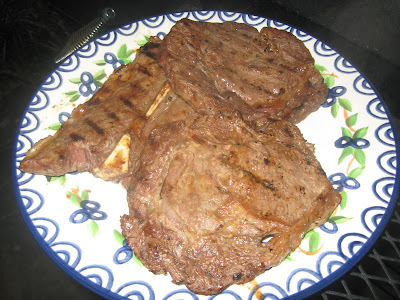 I knew they looked great, but beauty is only bone deep when it comes to grilling (and two of these steaks did not even have ones - rib eyes I think they said - but I'd bet no money on that). The real test was around the table. Well, it was on the couch tonight, because the basketball games are on, and who is a Grill Girl to mess with that? I almost swooned when I took a bite of this steak sandwich with Allegro marinade. I'm Southern, and I'm not totally sure about this swooning thing other than it means super extra good - yay. I guess I'm not really the full blown swooning type, but I do know what I like. The Allegra Teriyaki Marinade did, in fact, make the meat extra tender. It was like fork tender, and this meat is tough as heck as we've noticed time and again hoping to finish it off in this lifetime or sooner. In addition, the flavor was totally rocking with Allegro. Some Teriyaki is too salty for me. I am not the salt fan. A little is okay. Don't take it very far though, or I need water for the next week by IV is possible. I'm more into spice which is why I bought the Allego Hot & Spicy which is top of list in my book. We got a three thumbs up tonight. 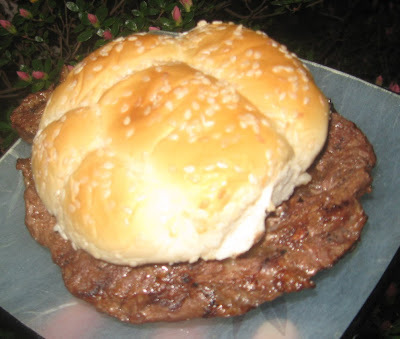 My mild guy can't handle the Hot & Spicy, but he loved the Allegro Teriyaki. In fact, he had two sandwiches, and he might have had another if I'd cooked more steak. This was a tough test for Allegro. If the marinade had made these thin and tough steaks even a little better, I would have been impressed. The marinade did take the tough out of this bad buy of steak I made. I can't say I've had a better steak sandwich even when using good steak cuts. I really put Allegro to the test, and they came out with flying colors. 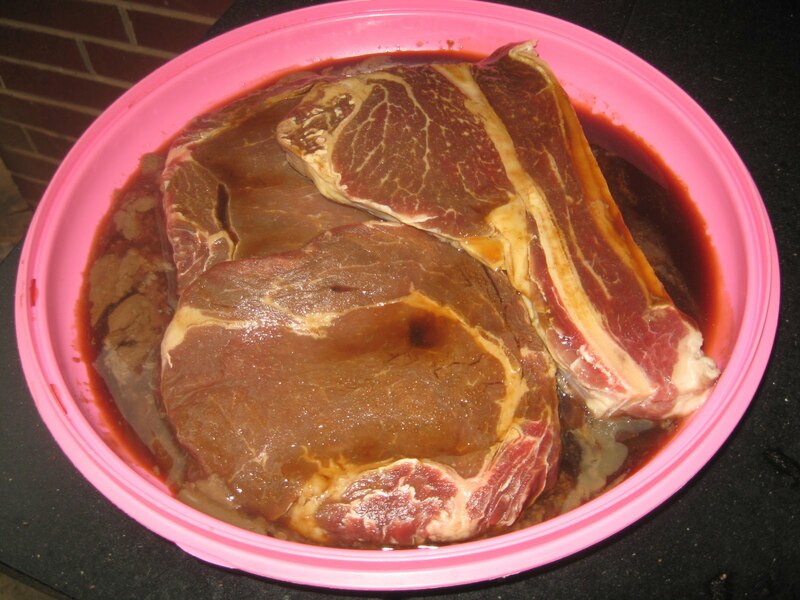 I would not have dinged them for not fixing up my tough as shoe leather steaks, but I am really thrilled that the marinade took them from pretty awful to fabulous. Really, the difference was that much! I say: Go out and buy some Allegro marinade. It honestly is some prime stuff when it made my ick steak an extra special meal tonight. I hate thin cut steaks. A few weeks ago, Alexis brought home a huge pack of thin SELECT (not even Choice) steaks and they were horrible to grill. Was so glad to see them go! If she gets you any more thin steaks, I swear by this marinade. Those grilled steak sandwiches were even better than they looked. Now I wish I had one, but it's breakfast time. Too bad no leftovers this time.